Oh, cruel Westinghouse, you are messing with my winter-addled mind. 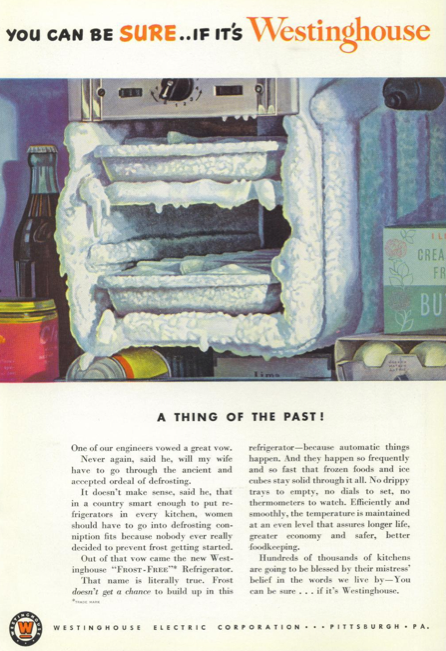 What you said in 1950 is a thing of the past—a buildup of ice and frost—I see in abundance right outside my window. How very…cold of you. But of course the company was addressing another kind of frost, the type which once afflicted freezers. My thanks to the anonymous engineer who banished this hand-lacerating substance from the modern fridge. Now, if only a similar solution could be devised for the driveway; a warming thought, indeed.